← giada’s balsamic bbq sauce. For a long time, I thought pecan pie was gross. Granted, I had never tried it, but I was pretty damn sure I hated it. I am still really not sure why, if we’re being honest (though I have noticed a pattern of foods that I “hated” until I actually ate them)… but, luckily, one day I got smart and TRIED some pecan pie, and fell in love with it. 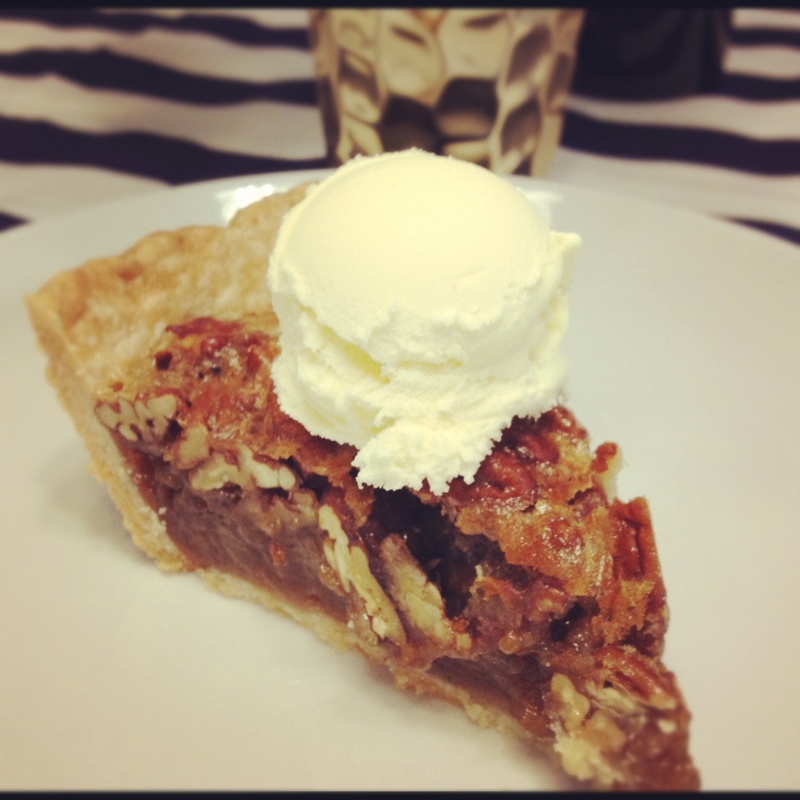 It’s not overly sweet, the whole pecans give it great texture, and it pairs perfectly with vanilla ice cream. Sounds like a winner to me! 1.) Preheat your oven to 350°. Normally, I would advocate for making your own pie crust… but sometimes, you need a shortcut. So, I used a pre-made crust for this one. Anyways, whether you want to make your own or use a pre-made crust, roll the crust out and fit it into your pie pan. Trim any excess from the edges. Chill the crust in the fridge (30 minutes), or freezer (10 minutes). 2.) In a small sauce pan, melt your butter. Once it’s totally melted, whisk in the brown sugar. Remove the mixture from the heat and whisk in the corn syrup, vanilla, and salt. 3.) Place your eggs into a mixing bowl, and lightly whisk them. Add a small amount of your butter and sugar mixture into the eggs, whisking continuously (this is called tempering the eggs, and it helps slowly raise their temperature; if you add a mixture that is too warm to the eggs, you’ll end up with scrambled eggs in your dessert, and that’s just gross). Make a few more small additions to the eggs (whisking continuously each time), until all the butter and sugar mixture has been added. 4.) Take your pie crust out of the fridge or freezer, and fill it with your pecan halves. Pour the corn syrup mixture over the pecans, and tap the pie pan lightly on the counter to make sure everything is well-distributed. 5.) Bake for 50-60 minutes, until the crust is golden brown, and the center of the pie has puffed up, and no longer looks wet or jiggly. 6.) Allow the pie to cool completely, and then refrigerate until ready to serve (you can make it up to 1 day in advance). Top with vanilla ice cream or lightly sweetened whipped cream. So, the second best thing about this pie (with the first being that it’s crazy delicious)? Is that it’s super easy to make! It’s practically foolproof, really; and if you use a pre-made crust, it comes together REALLY fast. Can’t beat that. the pecan is the greatest nut.